Twin Lakes Community is surrounded by an area offering diverse educational, artistic, and entertainment opportunities, as well as exceptional recreational activities, shopping, and dining. 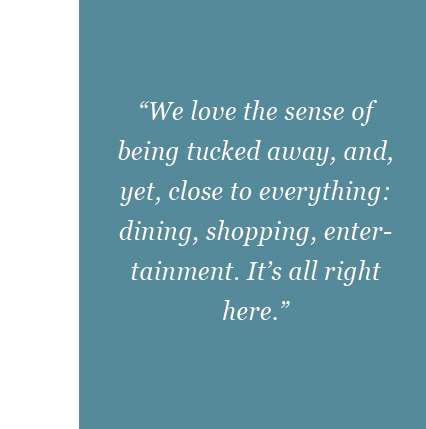 Burlington maintains a unique and pleasant balance of small-town southern charm with the benefit of being a thriving area nestled between unlimited opportunities offered in neighboring Triad and Triangle metropolitan areas. With two interstate highways located less than a mile from our door, it’s a quick drive to everything these areas offer, including world renowned medical facilities like Duke University, UNC, and Wake Forest Medical Centers. Also, our ideal location makes the beautiful N.C. beaches and mountains viable options for an enjoyable day trip. Our strong affiliation with nationally acclaimed Elon University, located two miles from our campus, provides a variety of entertaining, intellectual, and cultural events. Residents of Twin Lakes frequently attend performances of musicians, theatre productions or world-renowned speakers. Many of our residents participate in the lifelong learning institute offered through the university’s Life@Elon program. With infinite amenities and opportunities located within the immediate area or just a brief drive away, Twin Lakes Community is truly nestled in an ideal setting for any lifestyle. 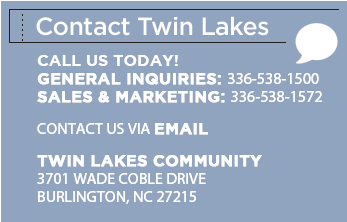 If you're looking for an independent living community with plenty of nearby entertainment, shopping, recreational activities, and dining, please contact us for more information about Twin Lakes Community.